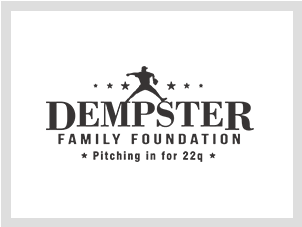 The Dempster Family Foundation was founded by Major League pitcher, Ryan Dempster and his family to raise awareness for a very common, yet not well known syndrome known as 22q11.2 Deletion Syndrome; 22q for short. It is also known as DiGeorge Syndrome and Velo-Cardio Facial Syndrome (VCFS.) Dempster’s five year-old daughter Riley was diagnosed with the syndrome shortly after birth. The disorder is caused by a tiny missing portion of the 22nd chromosome which can result in some of the most commonly recognized health issues for newborns and children world-wide. Unfortunately, many children suffer from symptoms of the disorder for years before being properly diagnosed. Although it occurs at a rate second only to Down Syndrome, it isn’t well known within the medical community or the general public. It’s the mission of the Dempster Family Foundation to raise awareness for this syndrome, while providing programs and support to individuals and families affected by this 22q11.2 Deletion Syndrome.